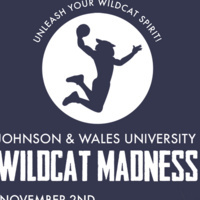 Join us for our annual "WILDCAT MADNESS!" Cheer on and support our JWU athletic teams and our student organizations as we showcase their achievements and talents! This late night JWU tradition will feature a variety of contests and competitions, as well as a few prizes! *Current JWU students only. Student ID required for entry. Due to seating constraints, no outside guests will be permitted. *Food and Beverage is not permitted in the venue and must be disposed of before entering.